It’s a conventional piece of marketing wisdom: Make your customers happy, and they will share your business with their friends and family. That sounds great, but the only trouble is ensuring people will follow through and actually remember to mention you to their networks. Enter Forewards, a Toronto-based marketing company that helps businesses using Shopify storefronts with emailing their customers. Essentially, these emails ask businesses’ satisfied customers to refer their products and services to other people. 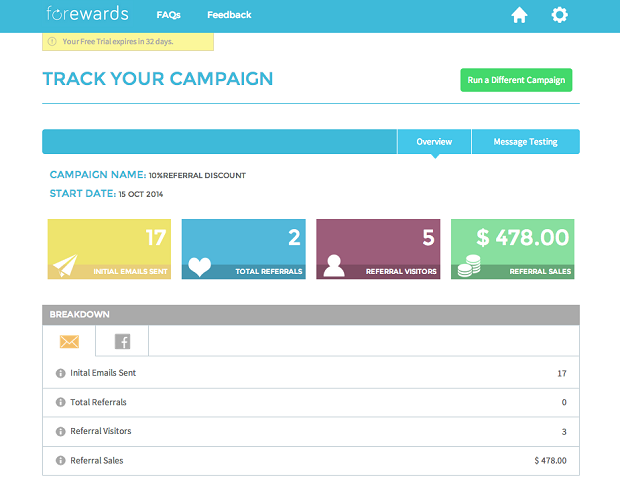 Campaign details for Forewards users. (Image: Forewards). This is an important type of marketing that businesses – and marketers – often overlook, says Jason Dea, Forewards’ COO. However, he’s convinced it has a lot of room to grow. That’s because social media marketing is mostly limited to whatever platforms will let you do, he adds. For example, Facebook has gotten a lot of flak for blockading businesses from reaching their audiences with their posts. Businesses can only reach a fraction of the audience they once did through organic reach, and they need to pay to increase that. But with referral marketing, businesses are essentially using Facebook organically by asking their customers to reach out to their networks, Dea says. “Maybe every one of your customers can reach two per cent of your audience, and in total, that ends up being quite a lot, and it’s a no-brainer way to spur a conversation about your brand and about your business online,” he says. Forewards was spun out of TooCoo Media, a company that had offered marketing services to other businesses for about four years. This past spring, the company decided to do a drastic pivot, and it is now focusing squarely on referral marketing. While the company had to shed some jobs to be able to change directions, Dea says it made sense to move towards a type of marketing that not everyone else is doing. 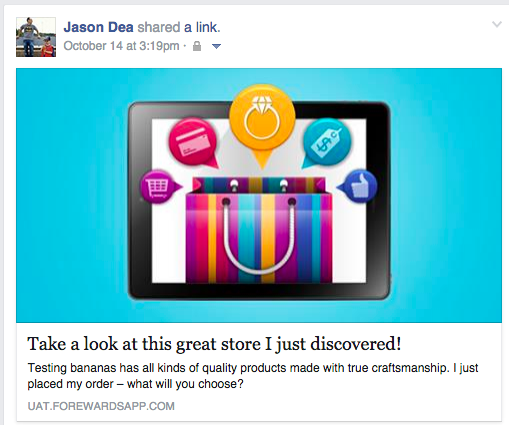 Forewards settled on referral marketing, and the strategy seems to be working. Out of the 200 campaigns that Forewards is currently running, 30 per cent of customers have referred the businesses they’ve worked with to their contacts, once they were prompted by Forewards’ emails. Some of the top performers have even netted six new online store visitors for every referral, with the topmost campaign scoring $3,000 in new sales within a two-week campaign. However, the average new-visitor rate is around 2.5. 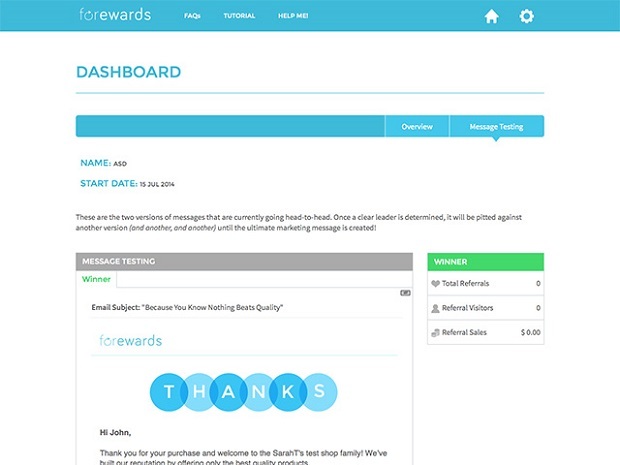 A dashboard for Forewards users when sending referral emails. (Image: Forewards). One of the reasons these businesses have succeeded with their referrals is because they’ve crafted enticing emails, Dea says. However, not every small business owner or e-commerce entrepreneur is a marketing-savvy writer, so Forewards provides templates for them to use. It also times emails so they get sent at the perfect moment – for example, right when customers receive their products and have them in their hands. Still, aside from using strong referral techniques, businesses also need to ensure they’re giving their customers a reason to refer them in the first place, Dea says. Did the Scott Brothers reveal the secret to being verified on Twitter?